Marriage God’s Way is a book by Scott LaPierre, a pastor from Washington who writes with a strong conviction that God, as the author of marriage, is not silent on the topic of marriage. Not only is God not silent, but as the designer of marriage, he is the ultimate authority on what marriage is and how it is to be worked out. In the interest of full disclosure I should admit that I have had the joy of getting to know Scott over the past five months and I consider him a friend and co-laborer in the gospel. I want to assure you that I am striving to remain neutral in this review– and if anything it has caused me to be a little more careful and slow to review his book than I have been with other books. As you all know, we are often a little more critical of those whom we love because we have a vested interest in sharpening our friends as they in turn sharpen us– often pointing out things in private which we might not in public. I was impressed with Scott’s interaction during this time. Instead of getting offended when I questioned a paragraph in his book, he responded with grace and humility and we had a fruitful conversation as a result. I mention this because I want you to catch a glimpse of the man behind the book. This is not another author trying to make a name for himself- he has a sincere love of truth and this says a lot about his credibility. With that said, Marriage God’s Way is a book that truly believe you should read. When I say this, I mean that you should really read it. Read it with the purpose of allowing God to root out the sin in your heart that resists fully giving yourself over to your spouse. Men, as much as we love our wives there are still times when we resist loving them as we should.I know this is true because we still resist God’s law and have deep hidden chambers of our hearts in which our affections are set upon the flesh. Women, for the same reasons I know that as much as you respect your husband, there are still parts of your heart which are not fully given over to him. This is true of all people because we are all in deep need of transformation— and praise God that he has set about the work of transforming us! Scott LaPierre gets this, and he demonstrates this by getting straight to the point about our marriage. The problems we have in marriage he says, are merely symptoms of a greater problem. The problem is sin. He sets marriage problems in the context of the fall and of redemption. LaPierre encourages us to not only embrace marital trials as opportunities for the sanctifying work of Christ to do its work in us, but also reminds us to keep Christ at the center of our marriage. As we embrace struggles in our marriage we get to see God do his work in us. All of this is set in the context of the fall and redemption of mankind, and this leads to an unfolding of what scripture has to say about a man loving his wife and a wife respecting her husband. LaPierre then dives into the topics of biblical submission, leadership, beauty, and how a man ought to treat his wife. He wraps the book up with a biblical view of intimacy and building upon the solid foundation of Christ. If I have any differences with Marriage God’s Way they are just personal preferences about how we speak about the means which God uses to sanctify us. After speaking with Scott about this I am confident that he and I ultimately agree that inward change is not brought about by obedience to God’s commands, but by the Spirit’s work in our heart as we hear and believe the promises of the gospel. This is not to say that Marriage God’s Way is lacking in gospel proclamation– it isn’t! Scott is faithful to proclaim the empowering nature of the gospel and our inability to please God apart from faith. Any difference that I may have is one of very slight emphasis. In fact, I would say that on the Law/Gospel continuum, we are mere inches apart and the distance is close enough to walk hand in hand together while proclaiming the same message. Again, going back to my initial disclaimer, I have scrutinized this book more closely than my other reviews because I want to avoid the appearance of favoritism. It is entirely possible that in my attempts to read with a critical eye, I have misread a few passages and have seen a difference in emphasis where there really isn’t one. Marriage God’s Way is a very good book with solid practical advice drawn straight from scripture. I would recommend this to anyone whether they are married or single. The reason for this is that whether we realize it or not, marriage is a shadow of the reality of God’s relationship to the church. The theological implications reach far past earthly marriage and probe the depths of God’s love for us. For singles, reading Marriage God’s Way will help to pave the way for the inevitable difficulties in marriage by preparing for marriage just as you study for a test. Scott LaPierre’s understanding of biblical love and respect are very good and his treatment of agape in particular is very convincing. This is a book that you will likely return to from time to time as a resource for aiding your marriage and counseling others in theirs. 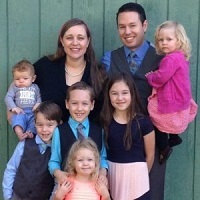 Scott LaPierre is the senior pastor of Woodland Christian Church in Woodland, Washington . He and his wife, Katie, enjoy a wonderful marriage, and they have been blessed with six children and a seventh on the way. Aaron this is what I need! Because I have had a hard time respecting Joseph as Jami probably told you I’m always complaining about how he does things and about the move and how hard it is. I need all the help I can get lol! I really love him and admire him but I just complain a lot. Is the book able to help me stop all this complaining? I don’t really see it as disrespect when I complain but Belah has been teaching me that it is what I’m doing and I need to show him respect. Serena. I may have an extra copy I can send you. I’m not sure about shipping to Ukraine. It may be expensive. But I can do that easily and I cheaper I think. Or there is a kindle version if you prefer. We’re praying for you and Joseph. He’s a good guy. Trust in God and trust Joseph’s vision for your family! Thanks for sharing so openly and honestly. Like Aaron said, you could purchase a Kindle version (less than three US dollars). I would also be happy to give you a PDF to read electronically. Please let me know if you’d like that! I appreciate Aaron’s counsel to you! Aaron with so many marriage books out there they all start to sound the same. How is this book different? Darren, one of the things that stood out to me is the pastoral nature of the book. Scott is a pastor and this book is based off of a sermon series that he gave. That alone makes it different from most books on marriage. The book, like a sermon, is intended to confront areas of sin and weakness in our lives and give a biblical answer. May I give you the first few chapters to read as a sample? Then you can decide if you’d like to read more! Thank you Scott. I think I’d like that. Scott I found your website and the free chapters for subscribing. My question so far is when you talk about pleasing God and not pleasing God. Are you saying that our good works please God? If you are I want to know what you mean. Do our works create a change in God from displeased to pleased? It sounds like you say that you moved God from displeased to pleased with you by changing your behavior. I’m just trying to square this with the reformed Baptist teachings from my pastor. Another question. I hear a lot about relationship with God but have a hard time finding a definition.You write about it too. Is that from the bible? Is that the same as being united to Christ like Paul talks about? If I’m right you hint that the test of a relationship with Christ is listening to the Holy Spirits prompts. Is this the test the Bible gives for being united to Christ? I ask because in my old days I was charismatic and it sounds like what I used to hear. I guess I don’t know your theology but I don’t think this site supports charismatic theology. I guess I would ask how you know if the Spirit is talking to you?And does the Spirit give specific messages to each person? Messages like a wife should trust her husband and not question him? It seems that there isn’t room for a wife to voice her opinion. Maybe that’s addressed later in the book? I know in my life, listening to my wife’s council has helped save a lot of headaches sometimes. Don’t they have the right to question us if we’re wrong? I had some more questions but don’t remember. Hello Darren, I’ll let Scott answer for himself but I can assure you that Scott’s theology is more or less in line with chapter 16 of the Baptist Confession. I’m not sure if that’s what you are getting at or not but if so, I believe that he would affirm it. I also don’t think he’s referring to a private revelation from God when he speaks of the Holy Spirit prompting. I assume he is speaking of the Spirit convicting a man/woman to do that which scripture has already revealed. Thank you very much for the review, as well as your friendship. The time you spent conversing with me while you read also sharpened me (Proverbs 27:17). I look forward to the next time the Lord allows our paths to cross. You’re welcome Scott. You have sharpened me as well and the thankfulness is mutual.